Rush: Album by Album pays genuine tribute to this iconic rock band's discography by moderating frank, entertaining conversations about all 20 of Rush's studio albums. Formed in Toronto in 1968, the rock trio Rush has gone on to multiplatinum success behind the distinctive high register and virtuosic bass-playing of frontman Geddy Lee, the legendary drumming and lyric-writing of Neil Peart, and the guitar heroics of Alex Lifeson. Despite having just four chart-topping singles since the release of their debut LP in 1974, Rush has nonetheless sold more than 25 million albums in the U.S. and more than 40 million worldwide. 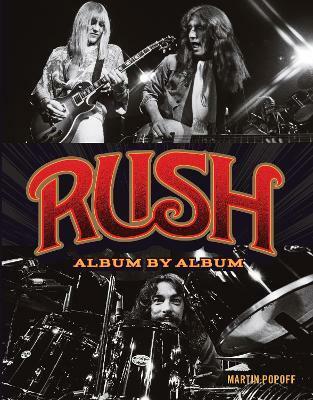 The Canadian trio may be the definition of an "album band," and this new book from prolific rock journalist and acknowledged Rush authority Martin Popoff pays tribute to the band's discography by moderating in-depth, frank, and entertaining conversations about all 20 of Rush's studio albums. Inside, the author gathers 20 rock journalists and authors who offer insights, opinions, and anecdotes about every release. Together, the conversations comprise a unique historical overview of the band, as well as a handsome discography. Popoff also includes loads of sidebars that provide complete track listings, details on album personnel, information on where and when the albums were recorded, and sidebar facts about the albums, their songs, and the band. At approximately 7,900 (with over 7,000 appearing in his books), Martin Popoff has unofficially written more record reviews than anybody in the history of music writing across all genres. Additionally, Martin has penned 57 books on hard rock, heavy metal, classic rock, and record collecting, including 2004's Contents Under Pressure: 30 Years of Rush at Home and Away, Rush: The Illustrated History, and Rush: Album by Album. He was Editor In Chief of the now retired Brave Words & Bloody Knuckles, Canada's foremost heavy metal publication in print for 14 years, and has also contributed to Revolver, Guitar World, Goldmine, RecordCollector, bravewords.com, lollipop.com and hardradio.com. Martin has been a regular contractor to Banger Films, having worked on the award-wining documentary Rush: Beyond The Lighted Stage, the 11-episode Metal Evolution, and the 10-episode Rock Icons, both for VH1 Classic. Martin currently resides in Toronto and can be reached through martinp@inforamp.net or www.martinpopoff.com.